The post Plotting markers on a map at zip code locations, using GMap or SGplot appeared first on SAS Learning Post. The post Bringing the heat! - Creating heat maps with proc sgplot ... appeared first on SAS Learning Post. The post How to create a 'pretty' map with Proc SGplot appeared first on SAS Learning Post. During my morning commute I heard an interesting news story about the merits and risks of the $100 bill. Apparently there are a lot of them in circulation, but no one knows exactly where they are. They are seldom used for legitimate business transactions because when a transaction reaches into the hundreds of dollars, the business parties tend to resort to a digital transaction (or maybe a good-old-fashioned personal check). 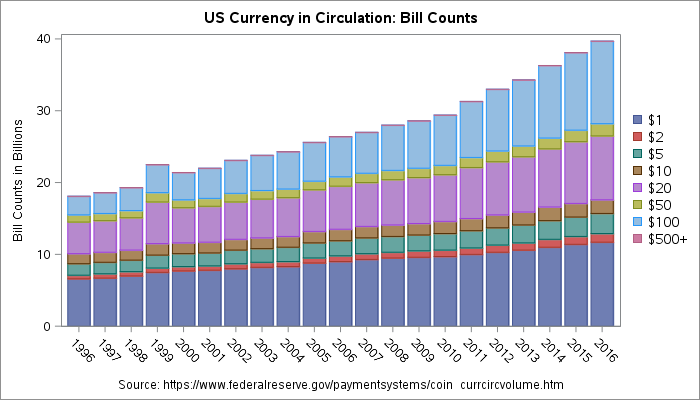 One stat from the story stuck with me: 80 percent of the currency value that is in circulation right now is in $100 bills. When I hear a number like that my first instinct is to find the data and verify it. 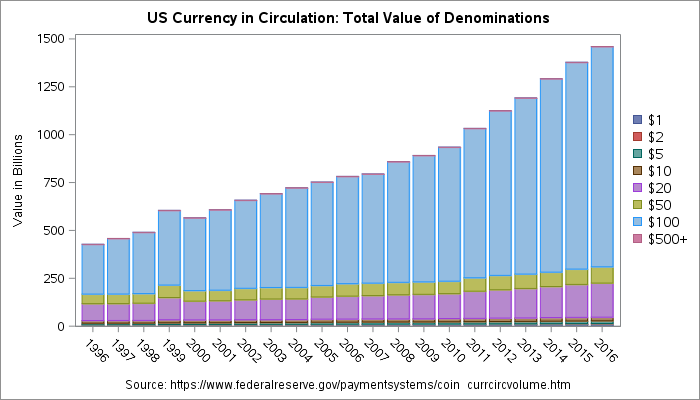 It was easy to find on the US Federal Reserve: Currency in Circulation web site. I could have copied and pasted the table for use in SAS, but the Fed already makes an ASCII version of the table available for nerds like me. With a bit of SAS code I was able to download the data, transpose it for analysis, calculate the currency values for with the counts of the various notes, and create a graph that verifies what I heard on the news. Indeed, much of our nation's cash wealth is floating around on a bunch of Benjamins. 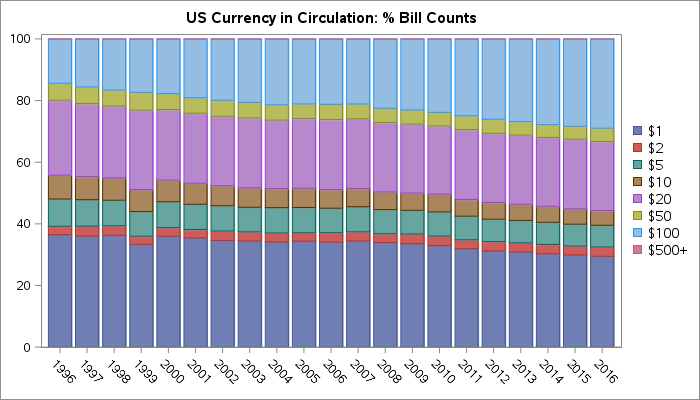 The percentage of wealth represented in the $100 bill has grown over the past 20 years, perhaps at the expense of the far-more-ATM-friendly $20 bill. In 1996, the ratio of hundreds-to-twenties was 60/20. Today it's 79/12. 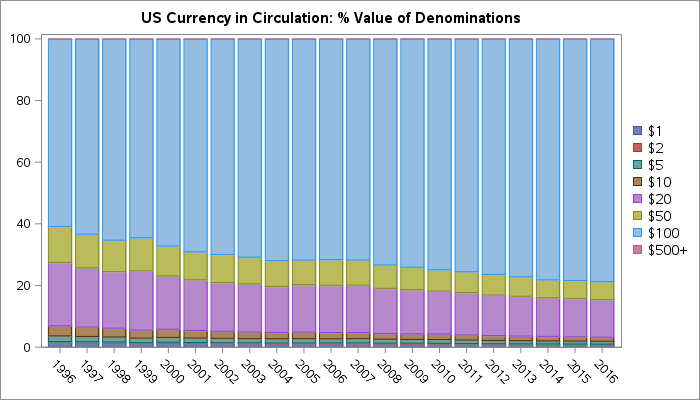 The post Visualized: US Currency in circulation, past and present appeared first on The SAS Dummy. SAS Community member @tc (a.k.a. Ted Conway) has found a new toy: ODS Graphics. Using PROC SGPLOT and GTL (Graph Template Language), along with some creative data prep steps, Ted has created several fun examples that show off what you can do with a bit of creativity, some math knowledge, and open data. 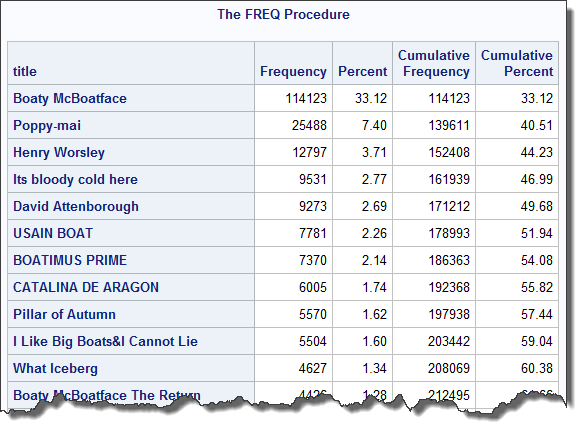 And bonus -- since most of his examples work with SAS University Edition, it's easy for you to try them yourself. Here are some of my favorites. Using the GIF output device and free data from Math-Aids.com, Ted shows how to use GTL (PROC TEMPLATE and PROC SGRENDER) to animate this Halloween icon. Using a vector plot, Ted shows how this championship swimmer dominated her event during the summer games in Rio. This example contains a lot of text information too; and that's a cool trick in PROC SGPLOT with the AXISTABLE statement. Click on the image for a closer look. This example is nerdy on so many levels. It's a take on the Computer Science 101 concept of "bubble sort," an algorithm for placing a collection of items in a desired order. In this case, the items consist of Christmas songs recorded by Michael Bublé, that dreamy crooner from Canada. 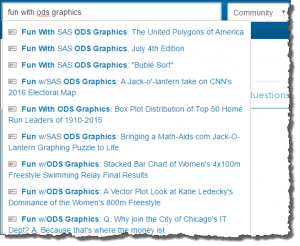 Ted posts these examples (and more) in the SAS/GRAPH and ODS Graphics section of SAS Support Communities. That's a great place to learn SAS graphing techniques, from simple to advanced, and to see what other practitioners are doing. Experts like Ted hang out there, and the SAS visualization developers often post answers to the tricky questions. In addition to his community posts, Ted is an award-winning contributor to SAS Global Forum with some very popular presentations. Here are a few of his papers. The post Binge on this series: Fun with ODS Graphics appeared first on The SAS Dummy. I know what you're thinking: two "Boaty McBoatface" articles within two weeks? And we're past April Fool's Day? But since I posted my original analysis about the "Name our ship" phenomenon that's happening in the UK right now, a new contender has appeared: Poppy-Mai. The cause of Poppy-Mai, a critically ill infant who has captured the imagination of many British citizens (and indeed, of the world), has made a very large dent in the lead that Boaty McBoatface holds. Yes, "Boaty" still has a-better-than 4:1 lead. But that's a lot closer than the 10:1 lead (over "Henry Worsley") from just over a week ago. Check out the box plot now: you can actually make out a few more dots. Voting is open for another 10 days -- and as we have seen, a lot can happen in that time. I could probably optimize by specifying an exception pattern instead of an inclusion pattern...but this isn't the sort of project where I worry about that. Will I write about Boaty McBoatface again? What will my next Boaty article reveal? Stay tuned! The post Boaty McBoatface is on the run appeared first on The SAS Dummy. In a voting contest, is it possible for a huge population to get behind a ridiculous candidate with such force that no other contestant can possibly catch up? The answer is: Yes. Just ask the folks at NERC, the environmental research organization in the UK. They are commissioning a new vessel for polar research, and they decided to crowdsource the naming process. Anyone in the world is welcome to visit their NameOurShip web site and suggest a name or vote on an existing name submission. 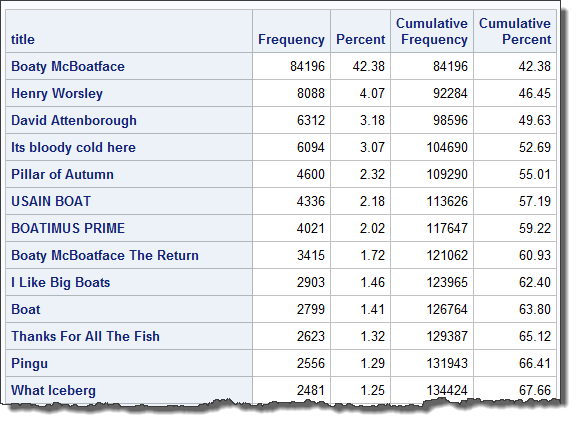 As of today, the leading name is "RRS Boaty McBoatface." ("RRS" is standard prefix for a Royal Research Ship.) This wonderfully creative name is winning the race by more than just a little bit: it has 10 times the number of votes as the next highest vote getter, "RRS Henry Worsley". The numbers are compelling: good ol' Boaty Mac has over 42% of the nearly 200,000 votes. The arguably more-respectable "Henry Worsley" entry is tracking at just 4%. I'm not an expert on polling and sample sizes, but even I can tell that Boaty McBoatface is going to be tough to beat. To drive the point home a bit more, let's look at a box plot of the votes distribution. See the difference between the automatic axis values between the two graphs? The tick marks show 80,000 vs. 8,000 as the top values. The post And it's Boaty McBoatface by an order of magnitude appeared first on The SAS Dummy. Here at SAS, we've come a long way with how we deal with blog spam on blogs.sas.com. Last year at this time, I was sifting through dozens of spam messages per day in order to salvage the one or two genuine comments that originate from real readers. I was just a human trying to keep up with machine-generated spam, a time-consuming -- and somewhat frustrating -- activity. I created SAS-based reports that showed the impact not just on me, but on the hundreds of other SAS blog contributors. 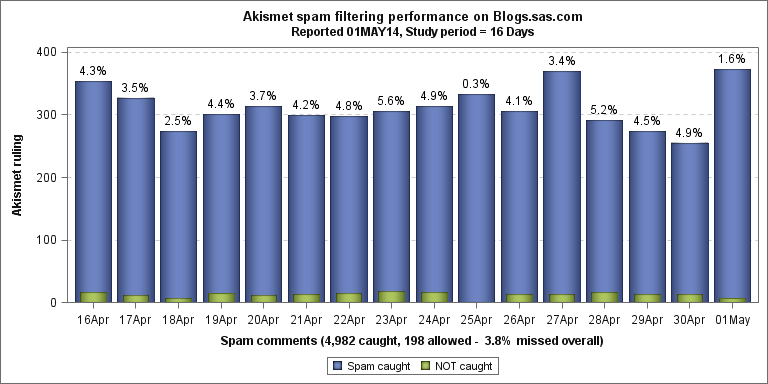 Thankfully in May, our internal IT support configured an industry-standard spam-filtering mechanism called Akismet. The spam flow ceased immediately, as if somebody turned a spigot. Recently, the spigot has been turned on slightly, allowing a few spam messages to leak through. The spammers are like an ever-evolving virus, constantly adapting their techniques to punch through our defenses. I wondered: with the leaks I'm seeing, how effective is Akismet for us today? It turns out that Akismet is very effective. 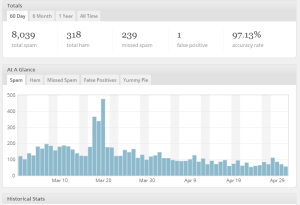 Despite the few messages that I see leak through daily, Akismet is catching over 95% of the spam messages that target our blogs. Over the last 16 days I saw 40 spam notifications hit my inbox. Without Akismet, I would have seen 741 messages in the same period. Yikes. I can see some of this within my WordPress blog administration screen, since the Akismet plugin embeds a sort of dashboard there. This is useful for me, but we have over 30 blogs hosted at blogs.sas.com. As far as I know, we don't have a view into how Akismet is performing for our entire set of blog properties. I don't think that Akismet costs us very much, and -- in my view -- the time that we save is definitely worth the expense. Spammers will always be with us and are just part of the cost of publishing content. But dealing with it manually? Ain't nobody got time for that.